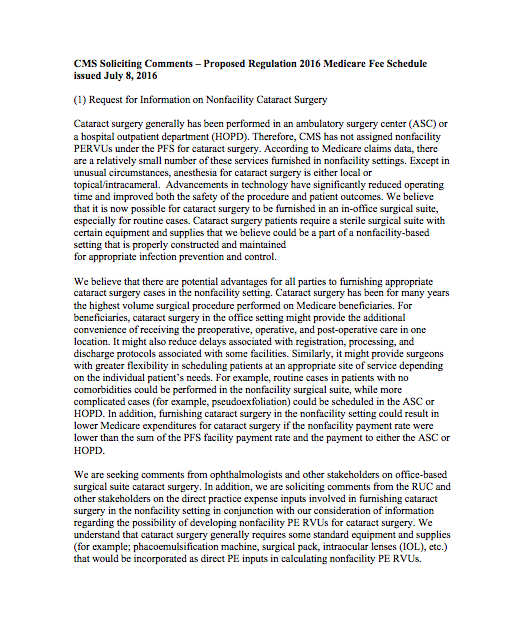 In its proposed 2016 Medicare fee schedule regulation issued yesterday, CMS is soliciting information from interested stakeholders regarding the advisability of paying for cataract surgery in the office-based surgical suite. Keep in mind that CMS is not formally proposing implementation of a program for office-based cataract surgery. At this stage, the agency is simply seeking feedback. 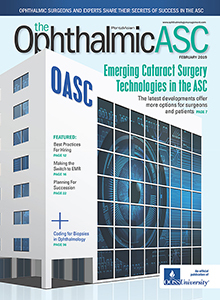 OOSS believes that the concept of office-based cataract surgery raises a number of patient health and safety issues as well as other concerns and we will address these in formal comments to CMS. We will also likely ask you, our members, to submit comments to the agency and will provide you with relevant talking points in the near future.